Founded in 2002, HostGator is a Houston-based company founded by Brent Oxley, who was a student at the time. Today, it’s in the top-ten hosting companies in the world, with more than 8 million websites on board. The company’s no longer in Brent’s hands, because in 2012 it was sold to the Endurance International Group. It was one of the first hosting companies to advertise “unlimited” hosting and was a pioneer in this area. And if you are ecologically conscious, you will be glad to hear that it is 130 percent powered by wind energy. HostGator has had a long life, thus far. But does it stand the test of time? Shared hosting is available in three packages. All include unlimited disk space, bandwidth and shared SSL Certificate and You can use HostGator Coupon codes for saving all your new orders at HostGator. Business: unlimited domains and a free toll-free number. VPS hosting gives you two IP addresses with all plans. Snappy 500: .5 core CPU, 512MB RAM, 25GB of disk space and 500GB of bandwidth. Snappy 1000: 1 core CPU, 1GB RAM, 60GB of disk space and 1TB bandwidth. Snappy 2000: 2 core CPU, 2GB RAM, 120 GB of disk space and 1.5TB bandwidth. Snappy 4000: 2 core CPU, 4GB RAM, 165 GB of disk space and 2 TB bandwidth. Snappy 8000: 4 core CPU, 8GB RAM, 240 GB of disk space and 3 TB bandwidth. Dedicated hosting has four packages. Basic: Intel Xeon Dual Core 2,3GHz (4 threads), 100Mbps uplink, 4GB RAM, 500GB RAID-1 Drives, 10TB bandwidth and two dedicated IP addresses. Standard: Intel Xeon Dual Core 2,5GHz (8 threads), 250 Mbps uplink, 4GB RAM, 1000GB RAID-1 Drives, 15TB bandwidth and three dedicated IP addresses. Elite: Intel Xeon Dual Core 2.5GHz (8 threads), 500 Mbps uplink, 8GB RAM, 1000GB RAID-1 Drives, 20TB bandwidth and four dedicated IP addresses. Pro plan: Intel Xeon Dual Core 3,3GHz (8 threads), 1 Gbps uplink, 16GB RAM, 1000GB RAID-1 Drives, 25TB bandwidth and five dedicated IP addresses. Reseller hosting plans go from Aluminium, Copper, Silver, Gold to Diamond. They all have unlimited domains, but the disk space bandwidth vary. Aluminum: 50GB of disk space and 500GB of bandwidth. Copper: 80GB of disk space and 700GB of bandwidth. Silver: 120GB of disk space and 1000GB of bandwidth. Gold: 160GB of disk space and 1200GB of bandwidth. Diamond: 200GB of disk space and 1400GB of bandwidth. After the standard signup and login, you will be sent an email with the information you need to log in to the main HostGator Customer Portal. It’s a central location from where you will be able to access or log in to all sections that are necessary for hosting. Main tabs are My Account, Billing, Hosting, Domains and Support; all are self-explanatory. My Account, Billing and Domains are administrative areas where you’ll manage settings and payments. Hosting and Support, however, are where you’ll spend the most of your time. In Support, you will not only get support, but you will also see your submitted tickets history. The Hosting section is where you’ll access all the meaty parts of your hosting account. Wondering if HostGator provides everything you need? There are FTP, Google Analytics integration, PHP configuration, IP deny manager, creating of other different accounts, cloud backup, database management, Weebly website builder and many other advanced features. The layout may not be the easiest to navigate, but it has a plenty of features that will satisfy all of your needs. If you want to access the control panel, you can either navigate via the hosting tab on the Customer Portal or go directly to the login page. There are a lot of options available through the portal, but more advanced options and features are, of course, in the control panel—some of them will even be redirected from the portal to the panel. When you access the control panel, you’ll see everything you need, as well as more advanced options like custom error pages or cron jobs. On the upper part of the left side, you’ll see a combination of helpful links and ads for paid features. The lower part of the screen has a short list of basic statistics. When you log in, you’ll be greeted with the setup wizard. If you’re looking for more information about using the tools provided in HostGator, there’s a section with video tutorials. The overall (default) look and navigation of the control panel is quite straightforward, but if you don’t like it, you can change the style. Setting up emails is easy. You’ll be able to get it done while getting started with your control panel. When you set up your email, make sure your password is strong and don’t limit your mailbox too much. There is no limit on the number or the size of the inbox, so the only limitation is the hosting plan you’ve chosen. There are also options that enable you to access to the email from your computer or via webmail. With advanced options like account level filtering and email diagnostics, when it comes to email versatility, all your bases are covered. There are two ways you can get your website online. You can either upload third-party scripts or you can build your own with Weebly, one of the most-used website builders. If you feel like staying in-house, you can experiment with drag-and-drop editor Weebly offers. We tested HostGator’s capabilities with WordPress script that was easily installed with Quickinstall. If you are a new customer, you will get a free transfer of an existing website, but there is no guarantee that it will be 100-percent successful. There’s also an option to use the goMobi builder, but it didn’t work for us. If you are a fan of WordPress (which a lot of people are), you also don’t have to be concerned, because it is compatible with HostGator, and with other CMSs like Drupal or Joomla. Another plus is that HostGator is on the MOJO Marketplace and there are a ton of premium options to choose from, such as e-commerce solutions. However, there is no verified script library, so you’ll either have to pay for them or look for them online. HostGator guarantees 99.99 percent uptime, which they lived up to until the company was sold to Endurance International Group in 2012. Since then, it has had several major outages, blackouts and even one social engineering attack in 2012, which compromised sensitive data like credit card numbers and website files. However, during our one-week independent uptime test with Uptime Robot, there was no downtime. Although that’s a fairly short period of time, it restores at least a modicum of faith in the company following its series of problems. Still, reliability and uptime are sensitive issues and since 2012, HostGator has lost some of its luster. Uptime only takes you so far. Yes, it’s important to have your website online, but it is also critical to have a website that won’t crash or lag when you have more than three visitors on it. With Load Impact, we put HostGator to the test. The average response from London, Dublin and Tokyo was about 1.5s, while the worst average response was from Sydney at 2s, which was understandable, considering the distance. All in all, it had a relatively fast response with a relatively stable response no matter how many users were on the website. When it comes to help and support, the results are contradictory. While submitting an email ticket on Friday, we got our answer on Monday, which makes it three whole days without any sort of answer. During that time, we were unable to access our hosting panel. On Monday, everything was resolved with one email, but the response time was long, especially in case of potential website downtime. Furthermore, the fix for the initial problem problem created yet another issue with the domain. We went to chat support to fix the second problem, waiting about three minutes to get an answer and the problem was solved in the next 20 to 30 minutes. While we had no problems with technical setups, administration and billing has proved that it’s in devil’s hands. Generally, they worked fine, but on more than one occasion, we had bad experiences with them. Overall, help and support are just average in response time, which in online terms, isn’t great. HostGator has frequent discounts. Various plans come with varied pricing, so keep in mind that pricing and discounts stated here may have changed when you visit their website. Most of these discounts are for new users. Unfortunately, there are no deals for long-term clients, which is a strange way to build customer loyalty. Shared hosting the longer the subscription period you choose, the cheaper the cost. Reseller hosting gives no price breaks for yearly contracts. Again, these prices are only for the first term of service, after which they will increase by 20 percent. VPS hosting also gives no breaks for signing an annual contract. However, these discounts are 40-percent off so prepare for much bigger prices in a long run. Again, these rates reflect a 40-percent discount—and it won’t last forever. With HostGator’s 45-day, money-back guarantee, there’s a longer than average deadline if you’re not happy with the service and want your investment returned. 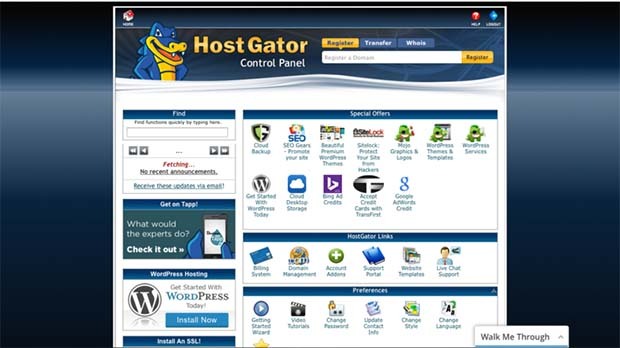 HostGator is a big brand name in the hosting industry for a reason. With reasonably priced plans and tons of options for building your website, it’s hard to deny its influence. One-click installation for third-party scripts make it easy to have a functional and attractive website. Perhaps it is too robust for total beginners and there are options that may be more than some people want to deal with, but it’s definitively worth a shot. The Control Panel may seem a bit overwhelming at first, but you can easily get used to it.You can read 10 question about HostGator for more information . However, its erratic help and support response time, combined with several serious downtime excesses, put a decent-sized wedge into its usually well-oiled operation. Some blame the Endurance International Group overtake. Certainly the timing of the incidents isn’t coincidental. All in all, the scale still leans towards positive side, but over time, it can seriously wobble. In the end if you have any hosting problems regarding the HostGator, feel free to launch “Houston, we have a problem” joke.